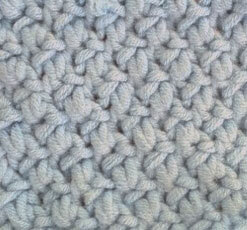 If I were skilled at sewing, I would love to knit a little bag using this stitch, and sew in a satin liner. I think it would look very pretty in a lighter weight yarn and lined with contrasting fabric! 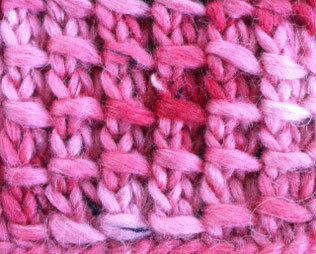 Whatever you use this stitch for, will look very pretty. My swatch did have slightly curling edges, so if you use this stitch for a scarf, I would add a border to help keep the fabric flat. Repeat these 4 rows for pattern. Enjoy! Wrapped Stitch is a beautiful stitch that is easier than it looks. 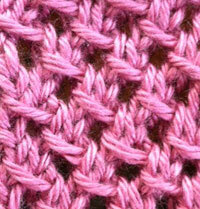 Worked over only two rows, this stitch pattern is also easy to remember. The sample above was worked on 14 stitches in Araucania Azapa on size US 10.5 needles. Repeat these two rows for pattern. 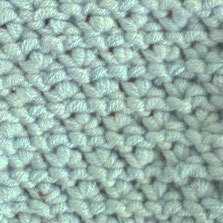 This stitch makes a somewhat dense fabric. The twisted or woven effect is achieved by working the stitches in groups of two - the second stitch is worked first, and then the first stitch is worked, and then both are dropped from the left needle. It's not as complicated as it sounds, it's actually fairly simple. This is a two row repeat, worked on a multiple of two stitches, and you can add as many or as few extra stitches as you like to create a border if you wish. 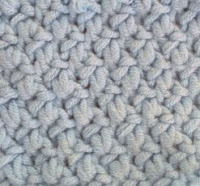 My favorite border to add to most of my knitted items is a seed stitch border, but a garter stitch border works just as well. Whatever you like! Row 1: Knit second stitch on left needle through the back loop, leaving it on the left needle. 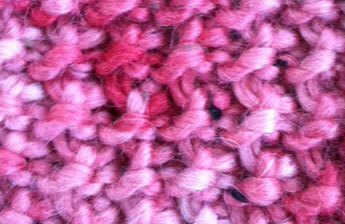 Then, knit the first stitch through the back loop, and drop both from the left needle at the same time. Row 2: Purl one, Purl the second stitch, leaving it on the left needle. 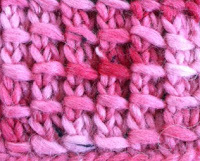 Then, purl the first stitch, and drop both from the left needle at the same time. Repeat to last stitch, Purl 1. 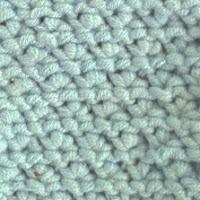 Here is the video for this stitch. Enjoy! Rosette Stitch is a very pretty, textured stitch. I like how the wrong side of the fabric looks also. This is a simple four row repeat, worked on an even number of stitches. I think the edges look sloppy, so depending on what you are knitting, you may want to consider adding a border, or just an extra stitch on each side to slip at the beginning of each row.